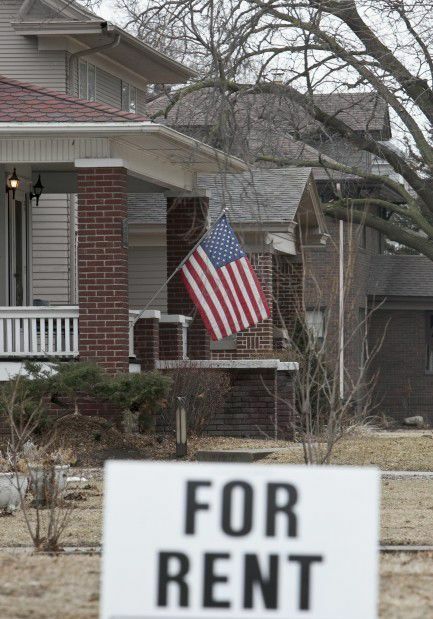 In this Feb. 28, 2012, file photo a yard sign reading "For Rent" is seen in Fremont. OMAHA — The city of Fremont will continue paying outgoing Kansas Secretary of State Kris Kobach at least $10,000 a year to defend its immigration ordinance even though the last legal challenge to the rule ended in 2014. Fremont's City Council unanimously approved its annual agreement with Kobach on Tuesday. Since 2010, the city has paid the Republican, who last month lost his bid to become Kansas governor, a total of $101,817. Kobach earned more than $800,000 in legal fees from several communities, including Fremont, for his immigration work over more than a decade. Fremont Mayor Scott Getzschman said the city wants to maintain its contract with Kobach, so he could defend the ordinance he wrote against new challenges and answer any enforcement questions that come up. "As Fremont continues to grow, if there ever would be a challenge, the City Council wanted to have Kris Kobach in their corner," Getzschman said. Kobach didn't immediately respond Wednesday to phone messages from The Associated Press, but he has previously defended his work for small cities as being part of a mission he believed in. In addition to helping communities such as Valley Park, Missouri, and Fremont craft ordinances related to immigration, Kobach served on President Donald Trump's commission on combating voter fraud that was shut down after a bevy of lawsuits challenged it. Kobach hasn't said what he plans to do after he leaves office. Fremont's housing rule requires residents to apply for a $5 permit and swear they have legal permission to live in the country. Only applicants who say they aren't U.S. citizens are investigated. Last month, voters in nearby Scribner decided to bar employing or renting residences to people living in the U.S. illegally. The ordinance, approved by more than 69 percent of voters, was proposed as the area prepares for an influx of workers for Costco's new chicken-processing plant in Fremont. The Costco plant will employ 1,000 workers when it opens next year. Colten Schafersman’s family has been farming in Nebraska since 1880. But on Thursday, the sixth-generation farmer looked to the future.